Jupiter’s Travels And Dreaming Of…. 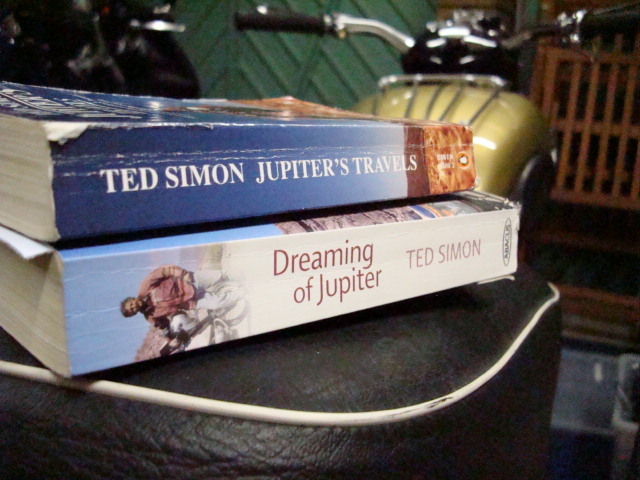 I had picked the original Jupiter’s Travels book up after a recommendation from a Norton riding friend and didn’t put it down until I had finished it. I was struggling with Zen And The Art Of Motorcycle Maintenance at the time, that could be another post…! In the modern world of the BMW GS1200 with all the trimmings, camera crews and satellite ‘phones it all seems so easy to conquer the world. Almost every corner of the globe has been trodden now and true wilderness and adventure is hard to find. Ted had none of this in October 1973 when he left to conquer 63,000 miles and 45 countries over 44 months. In January 2001, with German engineering instead of British, he did it again. The subject of the second book, Dreaming Of Jupiter. This time 59,000 miles through 47 countries over 29 months. If you like motorbikes or travel, or even both you can’t fail to be disappointed. I won’t harp on. Buy the books. Visit the Website. Dream the dream. Ted also announces his upcoming location at various venues throughout the world on his website so keep a close eye out and there are opportunities to order signed books and his DVD of Dreaming Of Jupiter also.